Consider this. Can you name anything you do without using your body? Unconscious acts like sleeping, thinking, or breathing all happen as a person uses his or her body. We Have Bodies is the first of ten lessons of The Healthy Kids Project. In We Have Bodies, content addresses the fact that we use our bodies for everything we do in life-- and that is why it is VITALLY important to take good care of them. 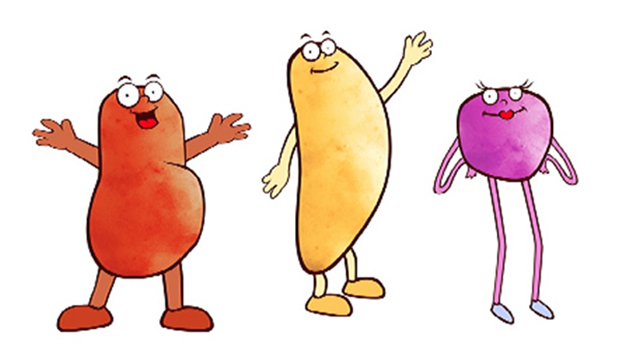 From this entry point, the project uses song, movement, animation and a cast of perfectly imperfect characters, the Zuber Tubers, to deliver key messaging that contrasts healthy choices and attitudes with unhealthy behaviors. The Healthy Kids Project is created to engage all types of learners: visual, auditory, or kinesthetic. There are 10 one-minute videos and correlating lesson plans, aligned to the TEKS, to educate and excite Kindergarten, First and Second graders on key concepts about health. Each lesson begins with a 60-second video with lively animation, music, and healthy messaging. The videos can either be used in sequence (1-10) to create a full story arc or as standalone videos. Each video can be played as frequently as you choose to introduce different lesson activities while reinforcing the key health messages. Also, in each of the lesson plans, there is an “a la carte” list of activities that you can select. You have the maximum flexibility to decide how these units can best fit into your classroom, your curriculum, and your schedule. However you use the materials, the important thing is to use them. Visit here to meet the Zuber Tubers. KLRN’s Healthy Kids Project supports healthy lifestyles by influencing eating decisions and physical activities. Through project resources, the audience is introduced to songs, live action movement, animation, and a cast of “perfectly imperfect” characters to deliver key messaging that contrasts healthy choices and attitudes with unhealthy behaviors. The station partnered with Harlandale Independent School District and Edgewood Independent School District to pilot the project in School Year 2013-2014 in San Antonio. Through the project, we shared media resources and lesson plans with 30 educators reaching 1,200 students. KLRN partnered with Edgewood ISD in 2014-2015 to deliver the program at all 10 elementary campuses—reaching over 2,900 students and supporting over 150 educators. In School Year 2015-2016, KLRN partnered with Edgewood ISD to continue implementation across all 10 elementary campuses- reaching over 2,800 students and supporting 140 teachers. The station presented an in-service training at each campus and met with each Campus’ Grade Level Teams to connect with the teachers. “Do you plan to use the materials next year? ": 80% of teachers shared that they would continue to teach the material. “Would you recommend the program to other teachers?”: 91% of teachers shared that they would recommend the program. “Would you recommend the program parents?”: 95% of teachers shared that they would recommend the program. To learn more about the project and for additional support, we encourage you to reach out to Mary at (210) 208-8405. The Healthy Kids Project is supported by the San Antonio Medical Foundation, a grant from the Medicine and Healthcare Community Advisory Committee and the Board of Directors of the San Antonio Area Foundation, Union Pacific Foundation, and St. Luke’s Lutheran Health Ministries. Teaching even one child the importance of caring for the body can positively impact generations to come.